AZ Desert Sky Volleyball Scores with Drive! 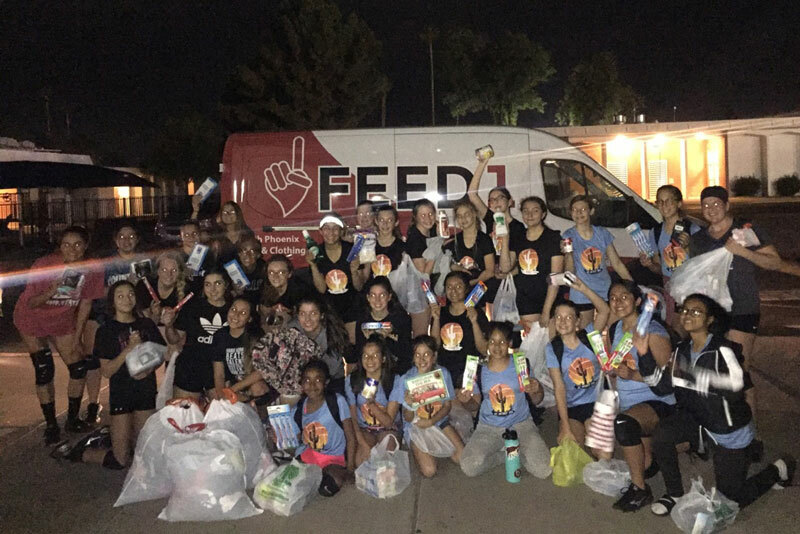 A huge thank you to all the players, parents and director of AZ Desert Sky Volleyball Club in Phoenix for hosting their club clothing and hygiene drive last month. In all, over seven teams filled our HCC FEED1 van more than once with thousands of pounds of gently used clothing and a mixture of hygiene items! Over 500 pairs of socks alone were collected! One 15-year-old AZ Desert Sky player even made her own Clothing Drive flyers, distributed them to friends, family and neighbors and collected cart loads of donations! We know it was a huge team effort and all of us at HCC are extremely grateful for each player and family who got involved! Thank you, AZ Desert Sky! Thank you, Season for Sharing! Last month HCC was awarded a $5,000 grant from The Arizona Republic’s Season for Sharing campaign! The Season for Sharing campaign raises funds annually then awards them to charities that have a strong commitment to helping neighbors and friends who struggle to meet life’s basic needs for food, shelter, safety and education. Since Season for Sharing began in 1993, more than $64 million has been distributed. The 2018-2019 Season for Sharing campaign generated $2.1 million and honored 162 Arizona nonprofit agencies with grants this year. HCC is extremely grateful to be one of those 162! Thank you to The Arizona Republic Season for Sharing campaign and your commitment to serve locally! 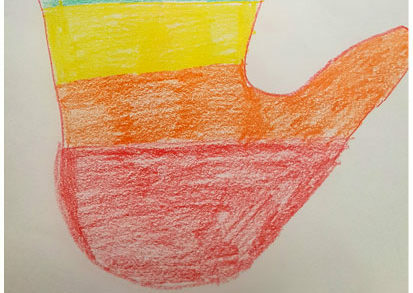 Take a look at our Thank You Video! 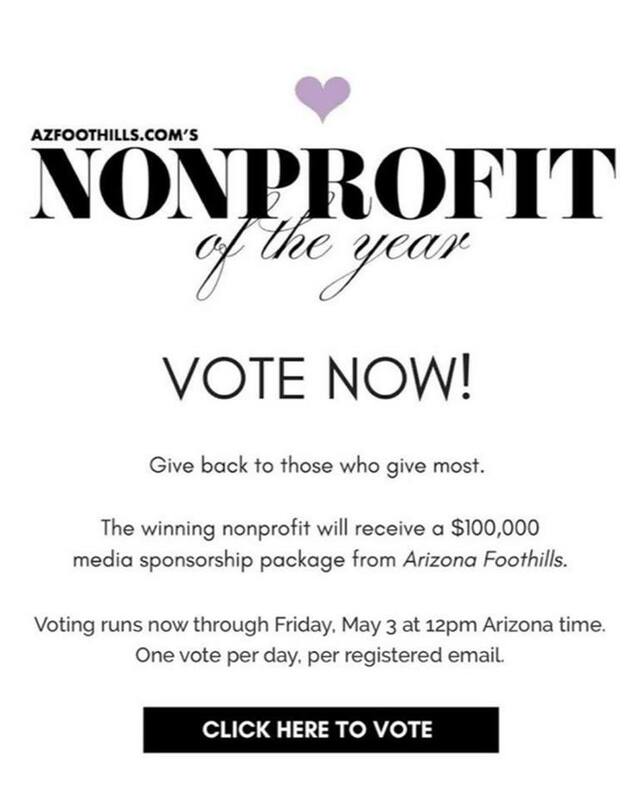 We’re thrilled that Harvest Compassion Centers have been nominated as Nonprofit of the Year by AZ Foothills! They launched a competition of over 100 local nonprofits and YOUR VOTE helps us win a FREE media package worth $100,000! But we only win with your DAILY VOTE! We are currently in Fourth Place but need 100 votes a day to keep pace! Please click on the link below and take five seconds to VOTE for HCC today! Thank you, AZ Foothills, for bringing awareness to our community of the awesome work being done. Help HCC WIN the IMPACT AZ Grant with your State Tax Credit! Last Chance! Once you figure out your Arizona state tax liability you can donate what you owe to the state to HCC instead. Arizona law allows you to make your tax-credit gift up until April 15, 2019 for the previous year. That’s right! Donate your tax amount, then submit your HCC giving receipt to your CPA and ask for your dollar-for-dollar credit, be sure to include HCC’s state code: 20157. If you live outside of Arizona, let’s hope your state follows Arizona’s lead soon! Millions are donated each year through the state charitable tax-credit program and assists thousands of nonprofits just like Harvest Compassion Center. Thank you to all who have made their tax-credit gifts to HCC for 2018. We are still seeking 100 more gifts to help us multiply each gift by winning this year’s IMPACT AZ $50,000 Grant! 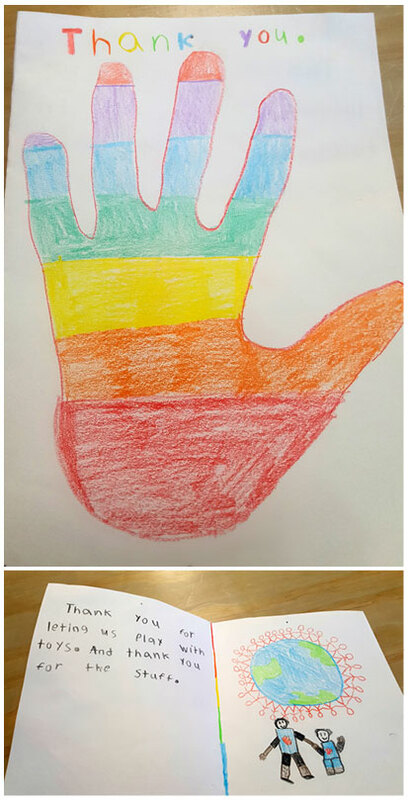 Each and every gift (no matter the size) helps us move one step closer! Please share this news with a friend today! 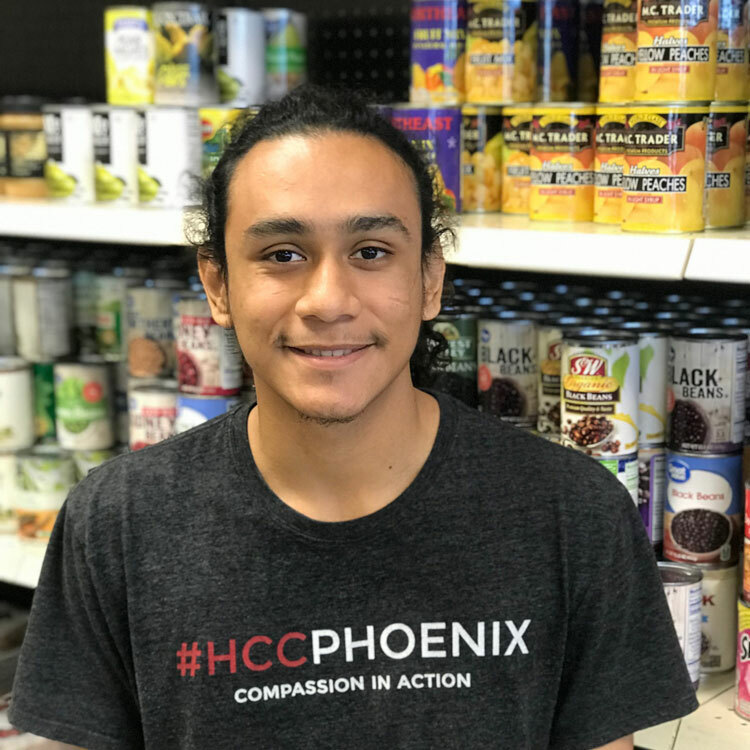 Help HCC WIN the IMPACT AZ Grant and donate online today! 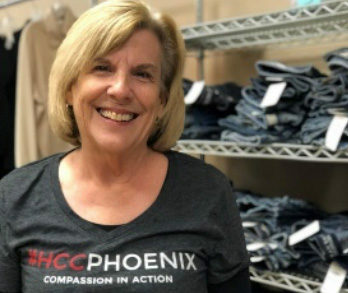 Every month HCC is honored to highlight one of our amazing volunteers, this month HCC Phoenix volunteer Cheryl Joseph is deserving of this honor! 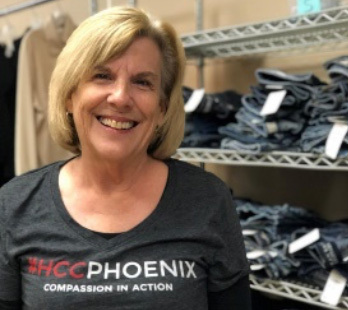 Cheryl, a Phoenix native, started volunteering at HCC Phoenix about 10 months ago after her sister had checked out HCC on a group outing. Cheryl thought she would check out HCC Phoenix for herself and signed up to volunteer. This mother of two and grandmother of three loves telling others about HCC as Cheryl is often the catalyst for outside food and clothing drives. She also loves spreading the word about HCC’s resources so those in need know where to shop. The entire HCC team thanks Cheryl for her countless hours of volunteering service at HCC Phoenix and the behind the scenes work she assists with when asked. Cheryl, you are an awesome example of someone truly serving the needs of others, thank you. 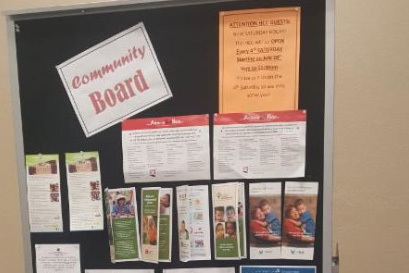 Each HCC location has a small community board that is constantly filled with information about free community events, job training, job postings, classes and more. 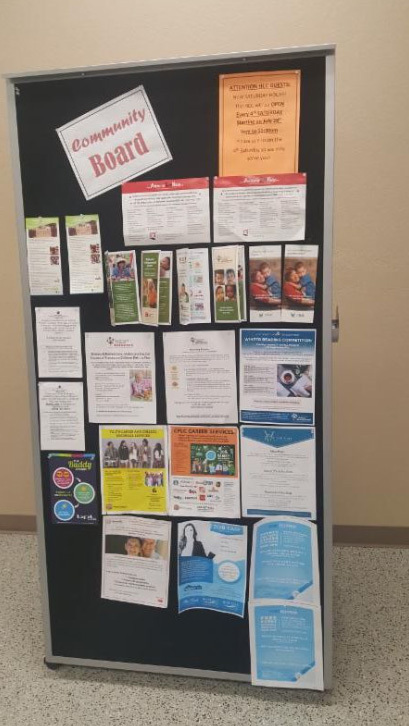 Last month a middle-aged woman visited HCC Maryvale and began reading the posted community flyers while she waited to be served. This lady had been out of work for several months and was feeling very depressed about her lack of employment. As she scanned the HCC board she saw a job posting and training opportunity for a very large bank in the area. She immediately thought, “There’s no way I would ever get that job!” Then she paused, and said to herself, “I have nothing else, so there’s nothing to lose!” She took a picture of the flyer, followed up that day, went through some training, then came interview time and … drum roll please… she GOT THE JOB! She came in the following week to HCC Maryvale and told the entire story and thanked HCC staff and volunteers for that community board! Last Chance to Claim Your 2018 AZ Tax Credit! Last chance to give your state liability to HCC & help feed families in the Valley! Once you figure out your Arizona state tax liability this month you can donate what you owe to the state to HCC instead. Arizona law allows you to make your tax-credit gift up until April 14, 2019 for the previous year. That’s right! Donate your tax amount, then submit your HCC giving receipt to your CPA and ask for your dollar-for-dollar credit, be sure to include HCC’s state code: 20157. If you live outside of Arizona, let’s hope your state follows Arizona’s lead soon! Millions are donated each year through the state charitable tax-credit program and assists thousands of nonprofits just like Harvest Compassion Centers! Thank you to all who have made their tax-credit gifts to HCC for 2018, we are still seeking 200 more gifts to help us multiply each gift by winning this year’s IMPACT AZ $50,000 Grant! Each and every gift (no matter the size) helps us move one step closer! Please share this news with a friend today! 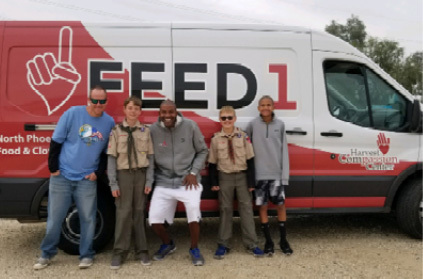 Each year the Cub / Boy Scouts of America challenge their troops to organize and run their own food drive. This year a local troop from Glendale chose to hold their food drive and then donate all the food to Harvest Compassion Centers. This small, yet mighty group of boys collected over 500 pounds of food in one day! It makes all of us at HCC very happy as well! Excellent job using your young voices, hands and feet to serve our neighbors in need! Keep up the great work!